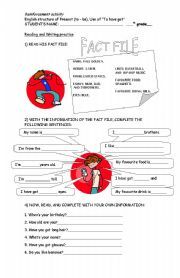 Reading comprehension, review of present tense, possessive adjective exercises, demonstratives pronouns, question and answer practice. 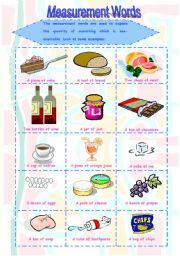 A type of pictionary with vocabulary related to measurement words. I hope you like it. What shapes can you see in each picture? 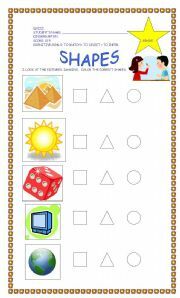 Children can identify some shapes in each different picture. Students can discriminate different types of actions, using the Present Continuous finding the odd one out or the action that it doesn�t correspond to the sequence. I hope you like it. 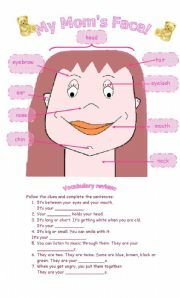 My mom�s face is a worksheet related to parts of a face. In this case, a member of a family shows each one of them. 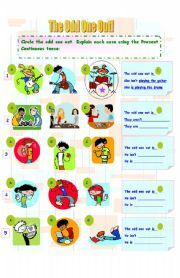 test for begginers, verb to be, demonstratives, time. 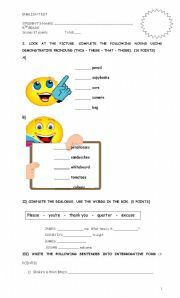 test for beginners, you can see demonstratives, time exercises, complete a short dialogue, verb �to be� exercises.